Hello everyone! It’s Katie, Jennifer and Mike’s assistant. This month’s blog post is all about coffee, something near and dear to every Seattleite’s heart. Before I moved to Seattle, I was a barista for two years in a local coffee shop. Therefore, I have some knowledge of the coffee world and my own coffee preference. So with this opportunity to live in a city built on coffee, I decided to explore two very different Starbucks’ with my best friend Mallory. 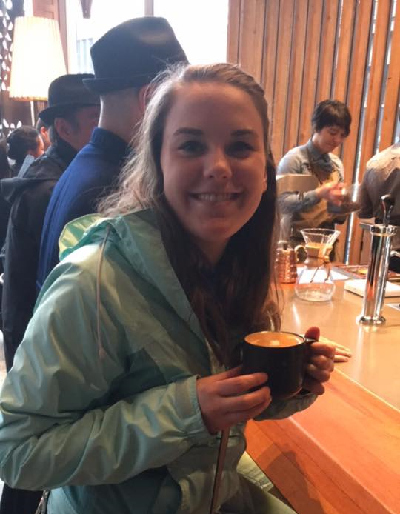 The two places we visited were the Starbucks on the 40th floor of the Columbia Tower and the newish Starbucks Roastery and Tasting Room in Capital Hill. The Columbia Tower is the tallest skyscraper in downtown Seattle and they have an Observatory on the 73rd floor, which costs about $15. But, the elevator ride to the Starbucks on the 40th floor is free! Obviously the views are not as great, but it’s free and Mallory and I are both financially conscious. So we grabbed an elevator and rode it to the 40th floor where we found a pretty typical looking Starbucks. The views were alright, but blocked by some nearby buildings and the weather was overcast so we couldn’t see very far. So, Mallory took some pictures and we headed on our way. However, this might be a good place for a cheap date on a nice afternoon. Next, we grabbed a bus to Capitol Hill to visit the Starbucks Roastery and Tasting Room. This place is massive! According to an article I found, it is a 15,600 square foot property that is rumored to have cost $20 million to build. 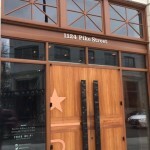 Starbucks has taken their love for coffee and created a once in a lifetime experience. As soon as I walked in I was in awe of the design and layout of the Roastery. There is copper everywhere! 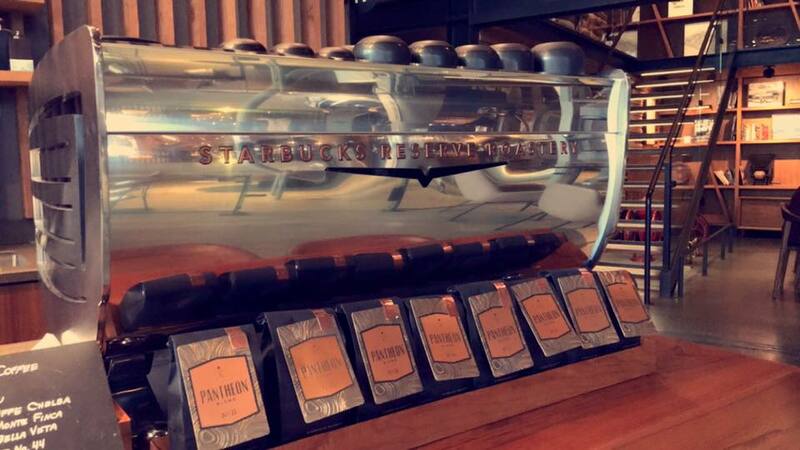 Starbucks even went so far as to design their own espresso bars. Espresso bars are extremely expensive in the first place, so you can tell how much thought they put into the environment of the roastery. 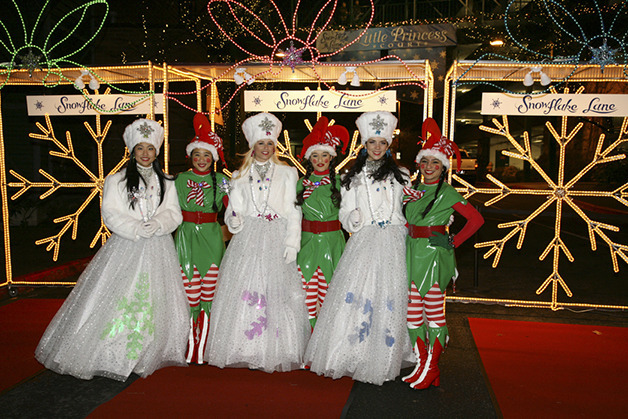 There are multiple areas where you can order coffee and a large gift shop. Mallory and I began by talking with the barista we met at the door and he suggested we go to the Experience Bar in the lower level of the building. 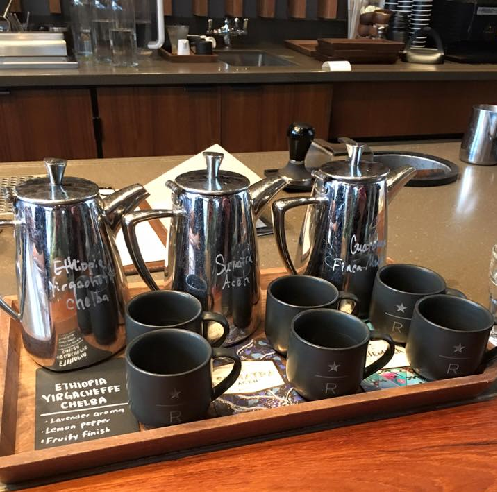 Once at the Experience Bar, we ordered a flight of three different types of Starbucks coffees and a smoked butterscotch latte. (That was probably too much coffee, but I’d like to think that’s not possible.) The coffee flight was cool because there was a very distinct difference between all the coffee’s we chose. It was interesting to taste them at the same time. The latte was good, but not something I would order again. It wasn’t overly flavorful and if I order a latte with butterscotch flavor I want to taste the butterscotch. 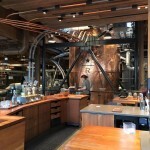 The best part about the roastery is that it is so different from every other Starbucks. You can tell from your first step in the door that a lot of time, money and research went into building this facility. This is a specific, behind the scenes look at the high end product that Starbucks can create. It is not your typical Starbucks on every single street corner, selling the exact same thing to impatient customers. The details are my favorite part, besides the coffee of course! Happy almost February everyone! It’s Katie, Mike and Jennifer’s assistant, again. This month’s adventure has taken me all over the Seattle area. Recently, the Seattle Times came out with an article titled, “Top 20 new cheap eats for 2016.” So, I took it upon myself to try as many restaurants on this list as possible. So far, I have been to three of the twenty: El Sirenito, Jackson’s Catfish Corner, and CaliBurger. 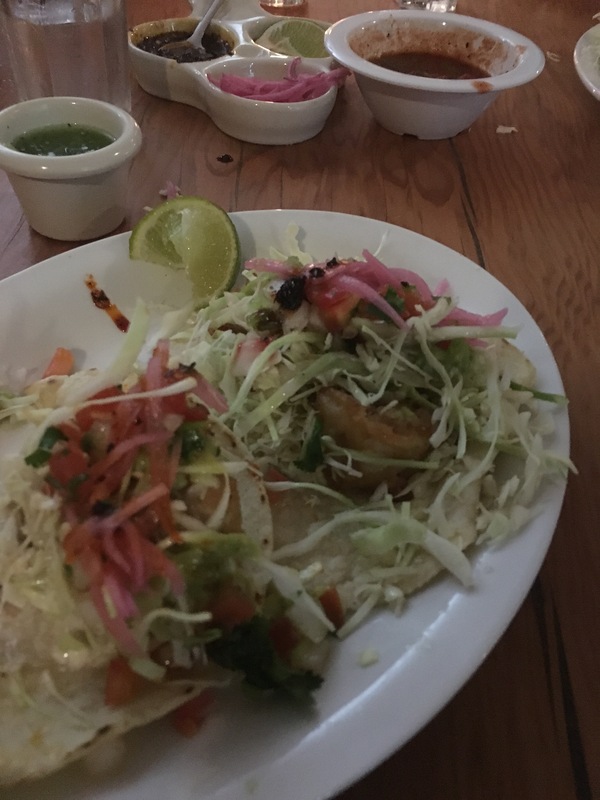 ordered the tacos because according to a yelp review this is the best fish taco place in all of Seattle. The chips were crunchy and tasted amazing with the salsa. I haven’t had many fish tacos but these were so delicious! They bread the fish and top it with lettuce, tomatoes, onions and something pink. Then they layered it all on corn tortillas. It was wonderful and I would recommend this restaurant to anyone! 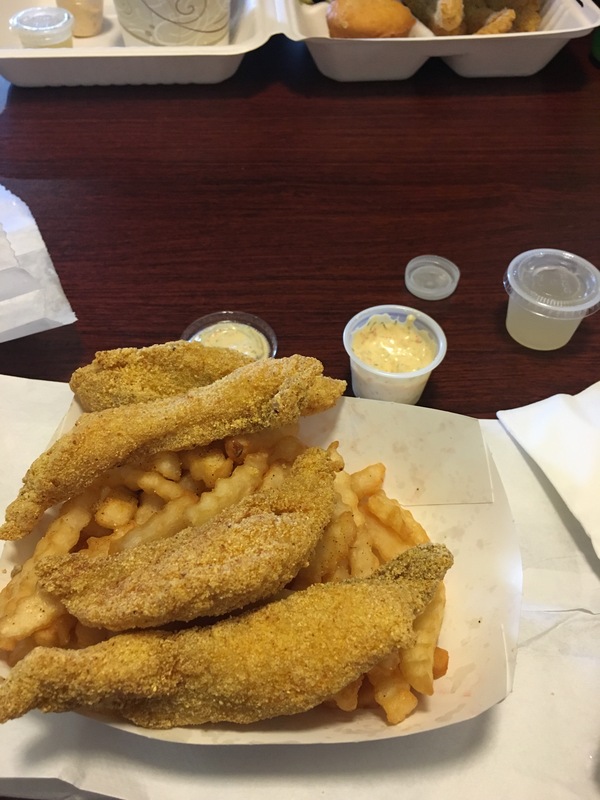 Second, Jackson’s Catfish Corner is located in Rainier Valley. It is in a very residential neighborhood that I had never heard of. Beware that parking is very limited and the parking lot doubles as a car wash, which happened to be busy the day I went. The building isn’t too big but the sign is definitely easy to spot. Now, to start this off I come from the land of Friday Night Fish Fry’s so I love any kind of battered fish and I have had my fair share. However, comparing southern style catfish to a beer battered fish fry isn’t easy. I ordered the catfish fillets and fries. They bread their catfish using corn meal, so it has a great crunch over the tender catfish. Another fact about this restaurant is that they use homemade tartar sauce. The tartar sauce is a reddish color because of the secrets spices they add. The catfish, tartar sauce, and fries were delicious. The catfish was perfectly breaded and cooked while the tartar sauce complimented it perfectly! I would definitely go to Jackson’s Catfish corner again and maybe order some hushpuppies too! Lastly, CaliBurger is located in the U District. 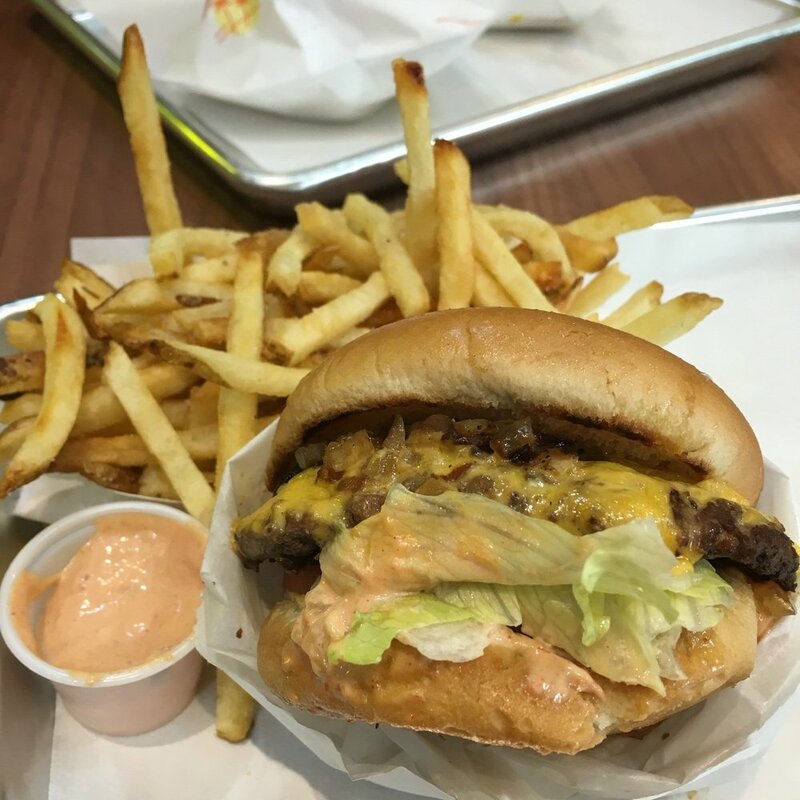 Almost everyone should know about CaliBurger in the U District because it is super similar to In-N-Out Burger. However, In-N-Out Burger hasn’t made it far enough north yet, so we have to settle for this. In my opinion, it tasted exactly like In-N-Out Burger. I ordered the plain hamburger and fries. The fries looked like they were made from an actual potato and they were lightly salted. They complimented the burger perfectly. 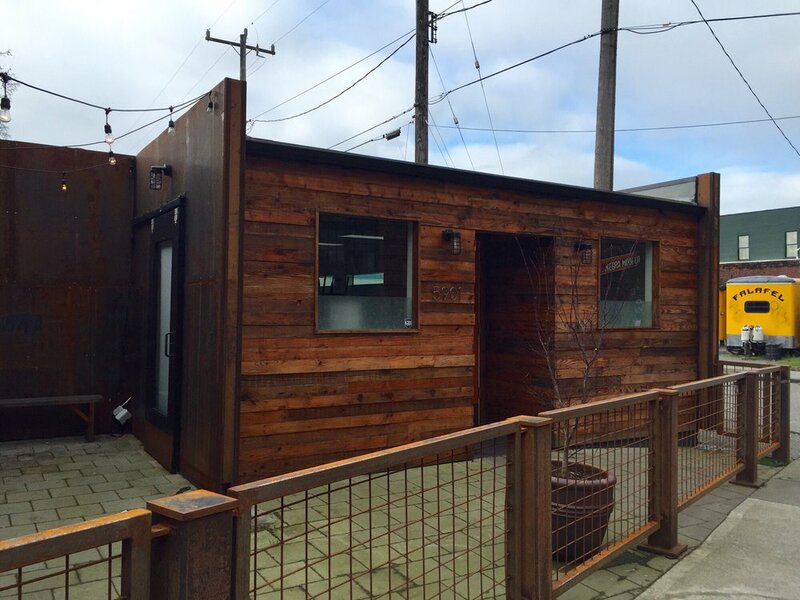 It’s a good place to grab a burger if you are in the U District, but the Yelp reviews make me give it a second thought. It was good enough, but I’ve definitely had better burgers. Overall, I would have to say that the best restaurant so far is El Sirenito. The tacos were so tasty and had lots of flavor. The chips and salsa were crispy and wonderful. Also, compared to the two other restaurants I tried the combined atmosphere, food and people made for a good time. I think El Sirenito would be a cool place to grab a drink in the summer and hang out by the fire. However, I still have seventeen more restaurants to try so this opinion may change as I go. Hello again. It’s Katie, assistant to Mike and Jennifer, and this latest adventure has taken me to the University District. 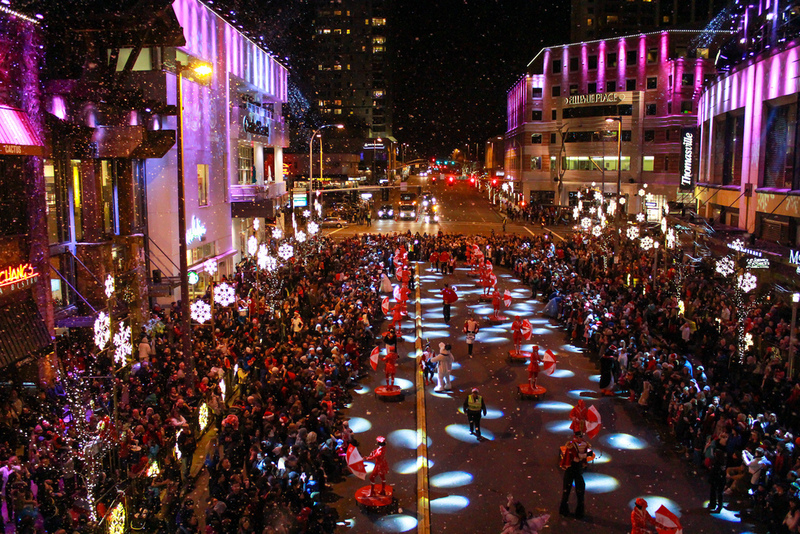 As the name says, the area is north of the city where the University of Washington is located. 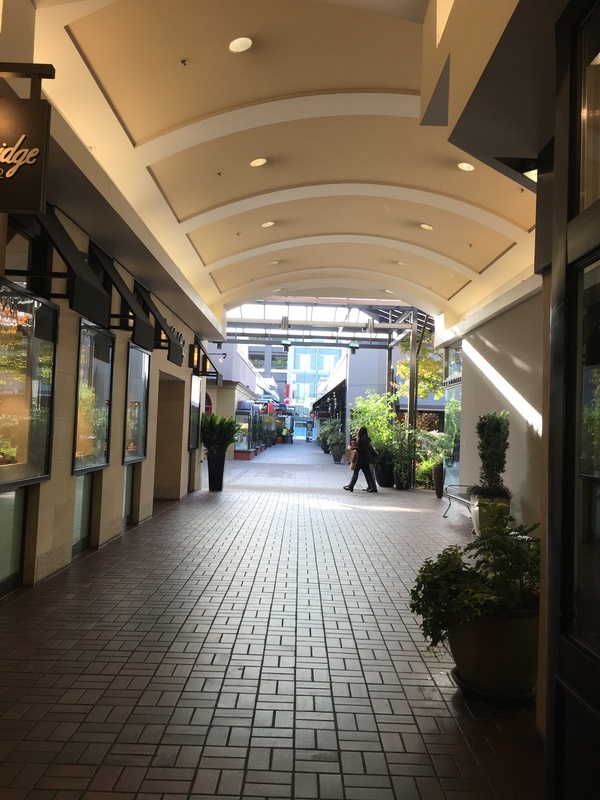 While in the U District I focused most of my attention on the University Village shopping area. I was told that Amazon had opened a bookstore in the U Village. This seemed weird to me because Amazon is so focused on online sales. However, the concept of this Amazon bookstore was very interesting because they only sell the top rated books from Amazon.com and each book has a plaque in front with a customer review. Also, the books they sell are mainly focused on the Seattle shopper. This allows them to sell a very specific set of books so they don’t sit on the shelves forever. I personally love bookstores and this one was well organized with a great selection of books. 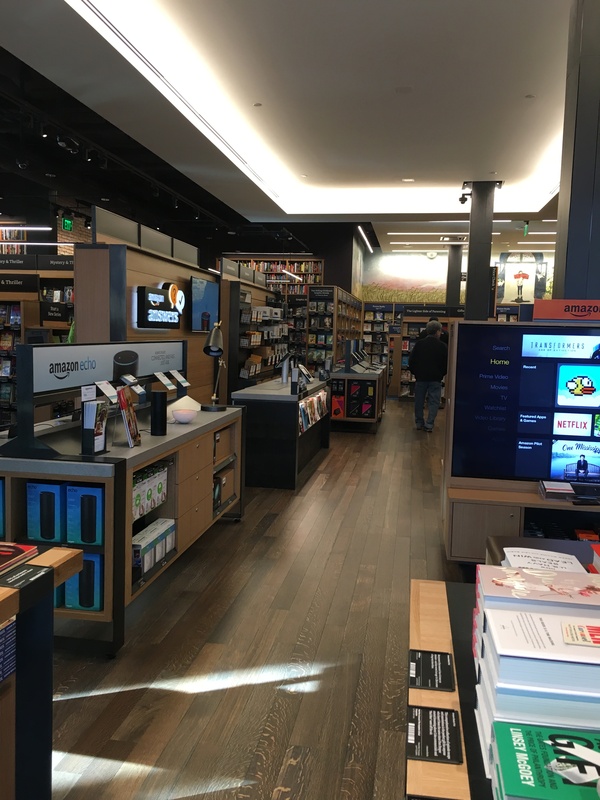 There was a special area in the center of the store for all the Amazon electronics and the surrounding area was shelves full of books. After the fun filled trip to the Amazon Bookstore I wandered around U village window shopping at Nike, American Eagle and some smaller stores. While wandering I noticed a place called Specialty’s Café and Bakery, so I decided to go in and see what they had for lunch. I ended up ordering the Turkey Pesto sandwich and it was wonderful! It was perfectly toasty for the cool fall day outside. After I was finished with lunch I drove around the University of Washington campus with no luck in finding a parking spot, so I called it a day. I’ll have to leave that blog post for another day. It’s Katie, the assistant to Mike and Jennifer. My latest adventure sent me to Kirkland. Kirkland is north of Bellevue along the banks of Lake Washington. My first experience in Kirkland was for their Oktoberfest celebration. Oktoberfest is a big deal where I went to college in La Crosse, WI, so I had to make up for missing it this year. Also, my boyfriend needed an excuse to wear his Lederhosen. We decided to take the bus so we could drink as much as we wanted. Before we got to the grounds we stopped at an Irish pub called Wilde Rover so my boyfriend could put on his Lederhosen. 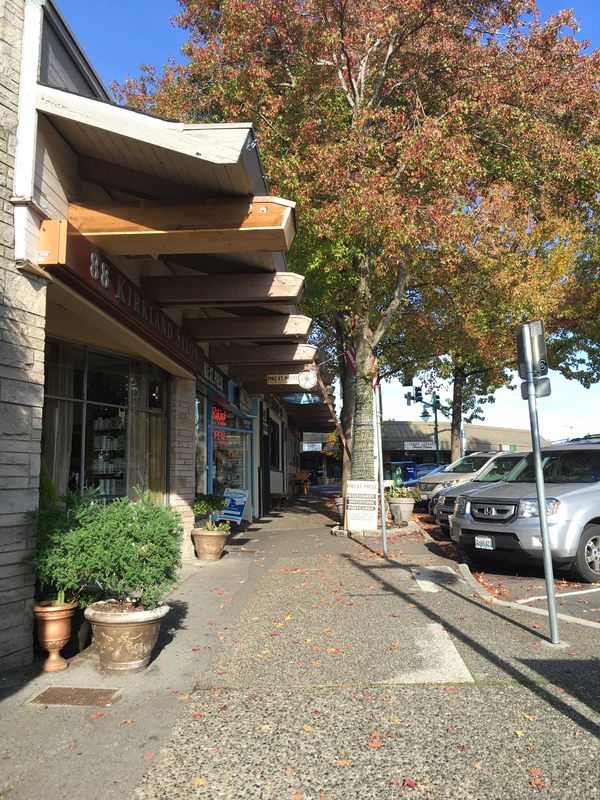 We started talking to a guy who grew up in the Kirkland area and has seen it change from a small town to a busy business city throughout his lifetime. Kirkland has changed significantly over the years, similar to the rest of the Greater Seattle Area. 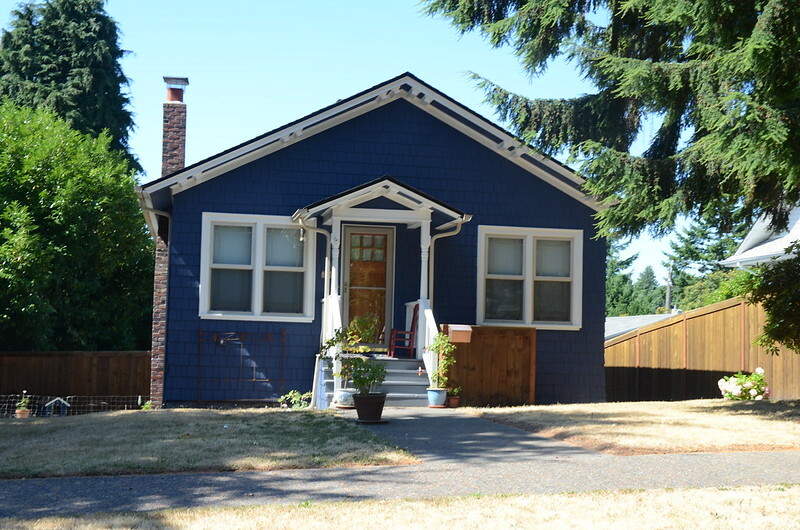 The current average home price is $650,000, Which makes it one of the most expensive areas of King County. I’ve spent most of my time in Kirkland near Marina Park and Downtown Kirkland. 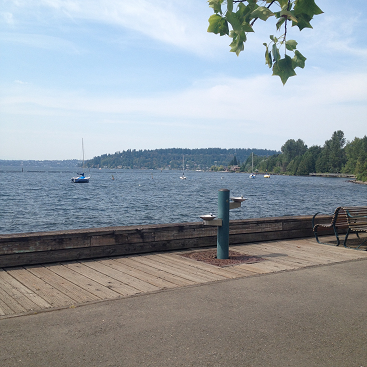 Marina Park is right on the edge of Lake Washington and you can see for miles. It’s a beautiful little park where they have lots of city events. Down the street from Marina Park are a lot of little shops. I didn’t stop in many because I don’t need a surf board and I wasn’t that hungry. However, it was a great little place to walk around and see what they have to offer. Hi, my name is Katie. I am the new assistant to Jennifer Clukey and Mike Elliott. 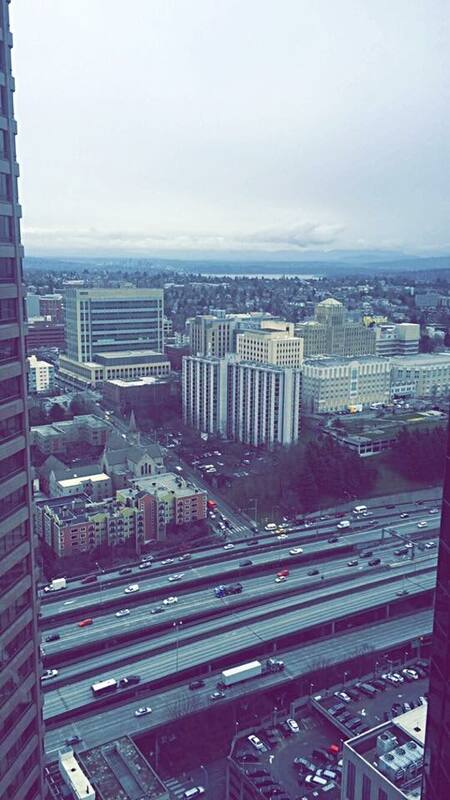 I just moved to the Seattle area from Wisconsin after graduating college. Here is my latest adventure in Renton, Washington! Renton, Washington is a town located just outside of Seattle. There are a variety of activities to do while in Renton. However, I only picked three places to visit; Coulon Park, the Landing and the Renton Farmers Market. 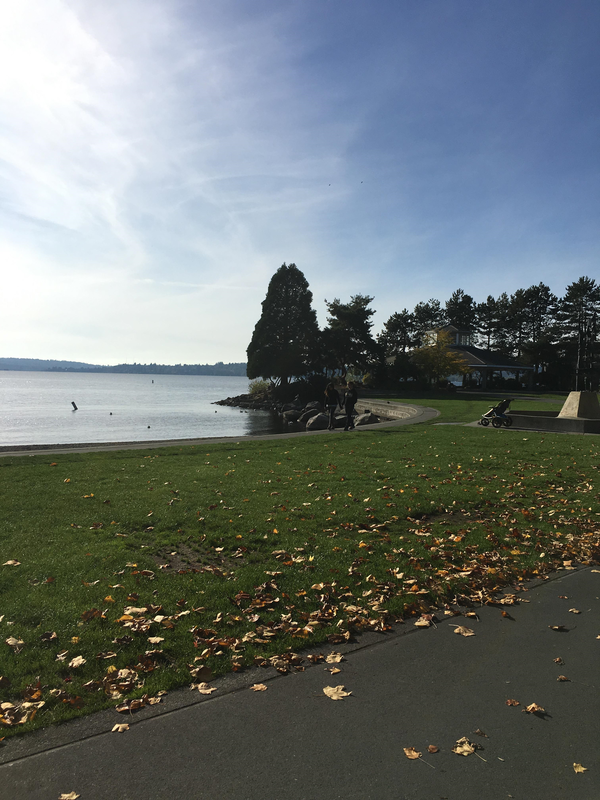 Coulon Park is located on the south end of Lake Washington. It is a great place to walk, run or just hang out. I also noticed an area where you could learn to sail. I thought that was pretty cool. This area was a really nice change of pace from the city life. Next I visited the Landing. This is a nice shopping area that has any store you could dream of; a running store, a hair salon, clothing stores, etc. As I walked through I stopped for a donut and then I moved onto a kitchen store. I stopped in the kitchen store because I love to look at things I can’t have, but I still ended up buying three items on my wish list. I purchased an egg ring for that perfect circular egg on a breakfast sandwich, an oven mitt because I only own one, and a dish to set my spatulas in while I’m cooking. The Landing also offers a variety of restaurants to choose from. For example; Vino, for wine lovers; Beer World, for beer lovers; and 5 guys, for a classic burger. Next I was off to the Renton Farmers Market which is open every Tuesday from 3:00 pm to 7:00 pm, June through September. I went in search of tomatoes for bruschetta and flowers to brighten my apartment. 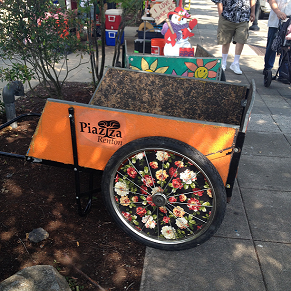 It was a cute little market in downtown Renton. There is free two hour parking in the garage across the street and plenty of booths to choose from. After eyeing each booth, I found ripe tomatoes and a $5 bouquet of flowers and was on my way. Renton is a nice area and cheaper than downtown Seattle, but it gives you the proximity to the city with a smaller town feel.